It’s evening time in Amsterdam and morning time in California. We are trying to get right onto Dutch time and going with the flow until hopefully 9pm! 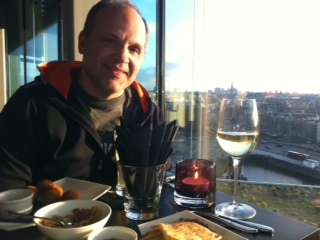 Here we are at the Sky Lounge at the top of the Double Tree, enjoying the sunset. Just gorgeous. The Big Reveal —-ta da!! Are you wondering why I’ve been noticing tulips and wooden shoes and train tracks? And why the talk of all this change? 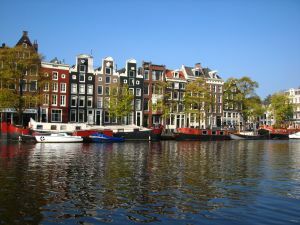 Today Jeff and I are traveling to Amsterdam, to find a new home, a new school, and new office space. We are beginning a new journey and adventure and figuring out all the pieces and hope you’ll continue with us. Click the FOLLOW button at the top of my blog and become a Subscriber. As I update this blog, an email will be sent to you letting you know something new has arrived. I hope you will follow me and continue to share the journey, adding comments or just reading along. I have the imagination of a child. It’s usually a gift as I laugh at myself. 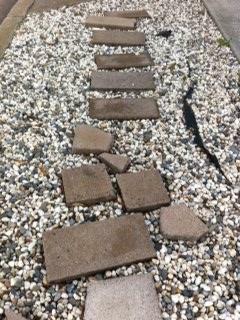 When I walk the kids to school, I usually point out the “railroad tracks” and I walk across them. The kids used to follow me but they’re big now and just smile at my silliness. They’ve been there for as long as I know, mainly for my entertainment I think. Crazy, I know but gives me a smile never the less. Today I’m learning to post to my blog via email by just trying it. Hope it works! These are the tulips I noticed on my walk in the neighborhood on the rainy weekend. I seem to be noticing things much more vividly lately – things I normally wouldn’t pay much attention to like getting gas for my car, driving the kids to school, running into friends on the playground – you know, the normal stuff you just do… Dropping in at Trader Joe’s, eating ice cream, cold baseball games, the rain… what’s going on? I’m slowing down and paying attention to my routines and am hyper aware that they will soon change. I like this awareness thing – I like noticing and being present and in the moment – seeing and feeling the rain and playing in it vs. running inside to stay dry. And letting the kids play outside, letting kids be kids. And when the time changed last week, I let them stay outside longer than I normally would so they can shoot hoops after dinner instead of rushing through the normal nightly routine. It’s good to slow down and pay attention and to enjoy what is. Life is good. 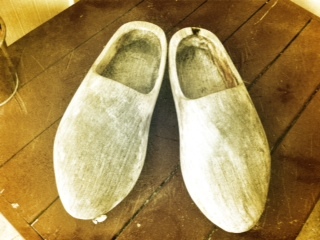 Wondering why I have wooden shoes? 14 Years ago, we traveled to Holland and visited our family’s wooden shoe factory, where the owner carved these especially for me. They’ve been sitting on my porch now for the past 11 years but are getting ready to travel back to where they came from… do you want to know why?